A free evaluation version of iEventsViewer with functional restrictions and limited run-time is available for download. Please register via the form on the right sidebar to download the iEventsViewer evaluation version. iEventsViewer tool program has been developed to support communication testing of IEC61850 server devices such as protection relays. 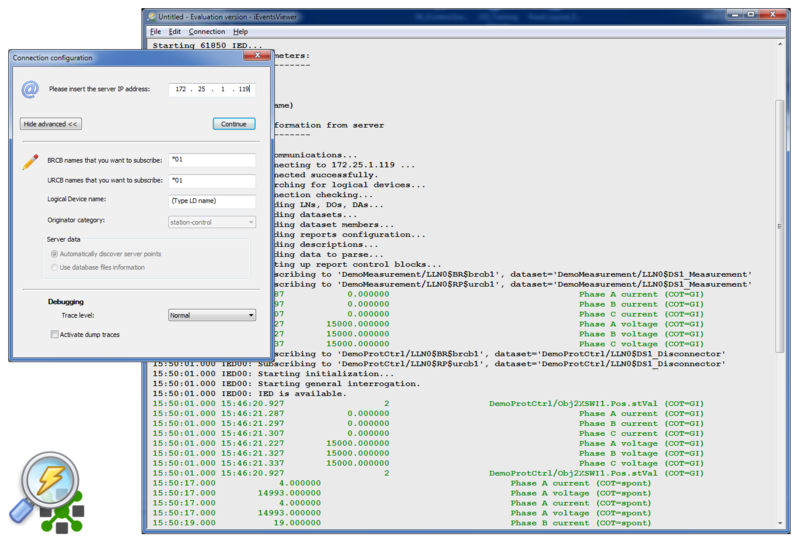 In the communication network, iEventsViewer acts as an IEC61850 client. It allows testing the communication with IEC61850 server devices, subscribing to server reports, discovering all IEC61850 server points, monitoring all the events generated by the IEC61850 server, and performing general interrogations and commands on the server. Easy to use (no installation required): users only need to enter the IEC61850 server IP address in order to discover all the logical nodes available and be subscribed to server reports. From that moment on, iEventsViewer will show all the events generated by the server.